Postcard showing a Thompson Switchback Railway in California in 1887. The oldest roller coasters descended from the so-called “Russian Mountains,”. These were specially constructed hills of ice located especially around Saint Petersburg, Russia. Built in the 17th century, the slides became popular with the Russian upper class. Catherine II of Russia was such a fan of these attractions that she had a few of these slides built on her own property. There is some dispute as to when wheels were added to carts for year-round operation. Some historians say the first real roller coaster was built under the orders of James the 3rd. The roller coaster was built in the Gardens of Oreinbaum in St. Petersburg in the year 1784. Other historians believe that the first roller coaster was built by the French. Les Montagnes Russes à Belleville (The Russian Mountains of Belleville). This roller coaster was said to be constructed in Paris in 1812. The Promenades Aeriennes both featured wheeled cars securely locked to the track, guide rails to keep them on course, and higher speeds. Although, the groundwork for the invention of the roller coaster was laid in Europe, the ride as we know it today developed in the United States. La Marcus Thompson is often credited as the “father of the roller coaster” building a switchback railway at Coney Island in 1884. While there is no doubt that he built Coney’s Switchback Railway, it doesn’t mean that he invented, or built the first — rather, he was the best at promoting and improving it. 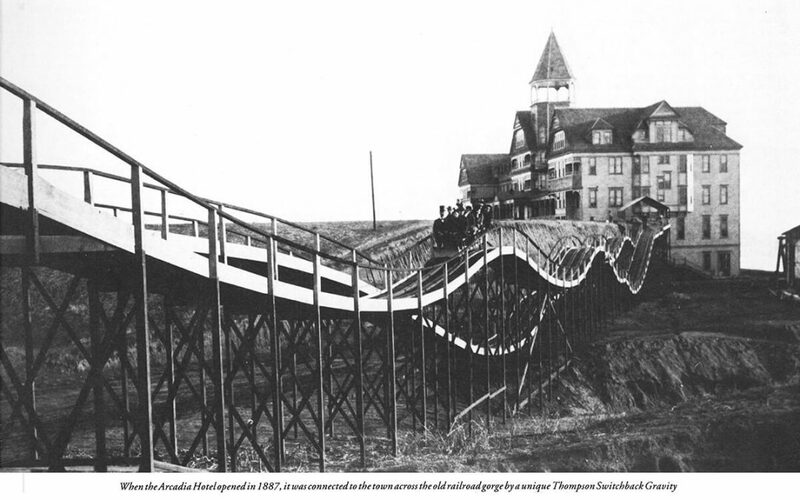 There are a number of early roller coaster patents, both switchback and circular, dating as far back as 1872. It is not certain, however, if any were actually built by their inventors. John G. Taylor of Baltimore was issued one of the first patents, and although many historians were convinced his switchback railway was never built, there is a photograph of it — but it is not dated. There is, however, a newspaper article dated 1874 that mentions several attractions at West Haven’s Savin Rock, including Taylor’s patented elevated railway cars. So we do know that one coaster was constructed at least 10 years before LaMarcus Thompson built his famous Coney coaster. We can credit La Marcus Thompson with making the roller coaster the feature attraction at amusement parks. Following the popularity of the Switchback Railway at Coney, others would build larger and faster rides. In order to stay competitive, Thompson continued to make improvements and build larger rides. From 1884 to 1887, Thompson was granted thirty patents. All of these patents lead to the advancement of the gravity ride.